All I want for Christmas is a little micro pig I’ll name Harry. Micro pigs, which are all the rage in US and the UK have attracted big showbiz names such as Paris Hilton, the Beckhams, and Rupert Grint. And for good reason. 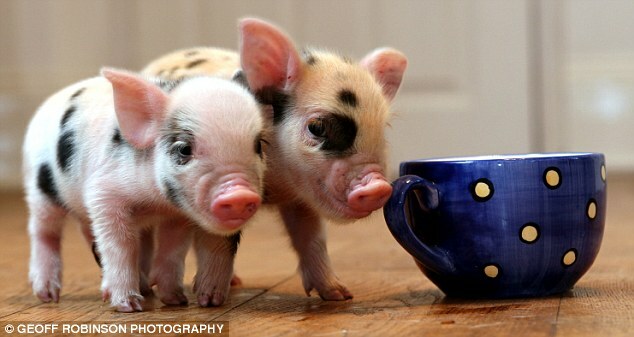 These little piggies, which are no bigger than a teacup when they are born, can weigh up to 65 lbs. and stand 14 in. tall. Reportedly, these animals are very clean (pigs actually are very clean animals, they have few sweat glands), very adorable, and very intelligent. According to Jane Croft, a leading micro pig breeder, they are the fourth most intelligent species after man, monkey, and dolphin. These pigs, which have been crossbred from choice lines, are very expensive in spite of their size. They can go for $400 to $4,000. So to all of my rich friends, you know what to get me for Christmas. Photo and information taken from this site.